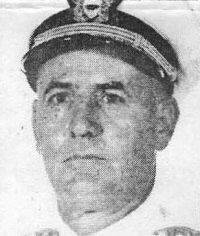 Admiral Mayfield enlisted in the Navy in 1942, became a radioman first class and participated in several South Pacific invasions. He was selected for officer training in the Navy’s V-12 program at the University of Southwestern Louisiana in Lafayette and returned to the United States in June 1944. He was transferred to the Naval Reserve Officers Training Corps at Tulane University in 1945. He was commissioned in the Naval Reserve and rose from ensign to rear admiral. He held four different commands spanning 20 years of his almost 40 years of service. Until his retirement, he was project director of Reserve Cargo Handling Forces for the Navy. He was awarded the Legion of Merit for outstanding performances in this capacity. At the time of his death, he was senior vice president of the First National Bank of Commerce in New Orleans. For more information about his life, see his obituary.